Final TW3 DLC Date Confirmed, what to expect from Blood and Wine 0 out of 5 based on 0 ratings. 0 user reviews. This past Tuesday The Witcher 3’s final expansion Blood and Wine was confirmed to be released May 31st, 2016. Earlier this year we received the first, shorter expansion of The Witcher 3: Wild Hunt called Hearts of Stone. Blood and Wine will wrap up Geralt of Rivia’s 3 game-long and almost 9 years of saga and lore that I’m sure will continue via fan fiction and other platforms after. Without any further nonsense, let’s get into the DLC. This is The Witcher 3’s full expansion, so it should/will be a solid 20-30 hours of gameplay. If we take a look back at Hearts of Stone, it was about 15 hours and they considered it a “Half-Expansion” so I expect Blood and Wine to be a good chunk of fun. It will most likely involve Katakans and other vampires as foreshadowed in the box game. CD Projekt Red hinted at twice in the game via contracts and conversation and if you completed a certain quest/contract in a certain order it would result with Geralt speaking to another Witcher and a Katakan. New upgrades have been thrown into the game called “mutations” and will now give Geralt special abilities. There are 12 mutations in total and they will all add an extra layer to combat strategy while providing heavy end game powers and crowd control like aspects. 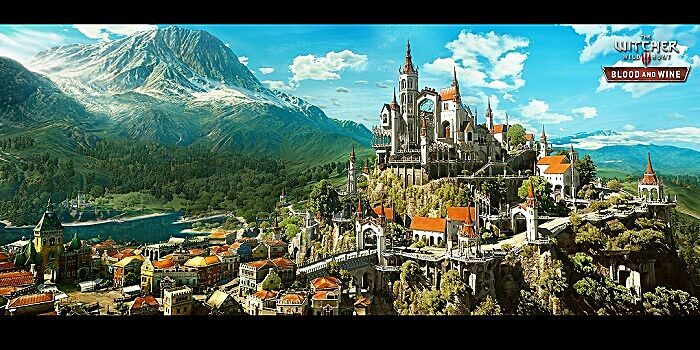 Blood and Wine is set in the region of Toussaint, modeled after the real life Piedmont Italy/southern France region, very different from the usual Witcher location filled with turmoil and war-torn villages. This is a place untouched by war. Toussaint is a lush, utopian royal society area that features fine arts, Wine, clothes, galas, and Blood. The playing area is very similar to the size as No Man’s Land in Velen from the box game but with many more points of interest, according to developers. In the box game, we were left with a cliffhanger for Ciri. I’m sure most fans, including myself, would like to see where she has gone, what has happened to her, etc. What happened to Yen and Triss? Both love interest options magically vanish at end game and you are left at the games starting point, Kaer Morden. I would like to see them expand on whatever lady character you chose. A home base based vineyard was announced in the DLC by the developers, and I hope there is enough customization to make us happy. Adding some paintings, some Monster heads from contracts , grow your own produce for food/money etc would be awesome. Maybe even have a little home where they can extend the relationship part of the game by inviting friends over etc. A smooth ending. I’m sure every single fan would love to see a magnificent wrap up to Geralt’s story and so would I. The adventures and missions have been wonderful but like CD Projekt Red said, all good things must come to an end. I hope this DLC will wrap up the story and game nicely.